In earlier posts we’ve looked at the great benefits and options for renovating your kitchen countertop. We also dedicated a post to tips on buying the most highly prized style of kitchen countertops, granite. However, let’s be honest, that’s a big expenditure and a large time commitment. Sometimes your kitchen needs that pick-me-up when you may not have the money, the time or either to do the full-on job. That though is no reason to put up with drab or overly worn-out tops. 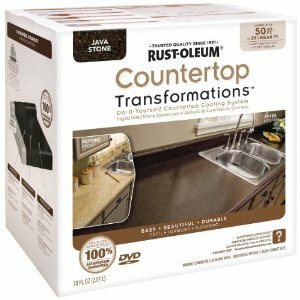 The Rustoleum countertop transformations kit provides a great solution for those on tight budgets and schedules. This countertop transformation kit gives you great do it yourself kitchen countertops. 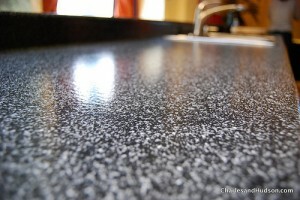 The Rustoleum Countertop Transformations system turns laminate countertops into fantastic granite countertops. It uses a multi-layer application system to create stain and water resistant surfaces. The layering process is finished with a revolutionary, industrial strength siliconized epoxy top coat that handles even harsh household chemicals. You don’t need to be a skilled tradesperson to get great results with this product. The kit’s complete coating system includes adhesive base coat, wetting agent, decorative color chips, 2-part protective top coat, diamond sanding tool, sanding block, decorative chip dispenser, decorative chip scraper, stir sticks, sanding guide, and a DVD and pamphlet with instructions in multiple languages. You can get your countertops in five different colors ranging from white to black. Among the options is charcoal, java stone, desert sand, and pebbled ivory. And consider this, the Rustoleum Countertop Transformations kit, covering up to 50 square feet, will likely cost about 60 percent less than installing new countertops. It can be applied to both vertical and horizontal surfaces. If your kitchen renovation project has involved toying with the idea of getting a new sink, using the Rustoleum Countertop Transformations kit would be a perfect occasion to combine the two efforts: it will make it far easier to have an even edge if you paint with the sink removed. If you have chipped laminate counters to start off, use an epoxy putty to fill them in before applying the system. The countertops hold heat up to 285 degrees, so be sure to use trivets for temperatures higher than that. Your personal investment of time in this project will be between 4 and 6 hours, but when you consider other factors, such as drying time, please plan for your kitchen’s utility to be hampered for about two full days. Don’t plan any conflicting dinner parties to show off the new counters too soon! And, while we’ve been emphasizing the kitchen here, remember, the Rustoleum Countertop Transformations kit can be used in the kitchen, the bathroom, on a home bar, and even on laminate furniture pieces. This is the budget-minded means to get that great granite effect in your kitchen. For more information, including product and technical details, have a look here.